Takeaway: Until November of 2017, growers debated the organic certification of hydroponics. Now, the verdict is in. While both sides still feel they’re in the right as to whether or not hydroponic produce should be certified as organic, that argument ended on November 1, 2017, with an industry decision that such certification was allowable. The highly emotional status declaration came down at the Fall 2017 NOSB meeting in Florida, where the advisory body to the USDA ruled that hydroponic and aquaponicfarms could carry the organic label. They’ve been allowed to be called organic for a number of years, but now it will be official. Still, the proverbial Hatfield and McCoy battle on the issue remains pretty heated. Both sides still believe they have the best idea. The Coalition for Sustainable Organics put the approval in the win column for them, pleased that NOSB rejected a number of proposals that would revoke the certification of many hydroponic, aquaponic, and container growers. President Lee Frankel’s contention was that more, not less, organic product was needed to feed a hungry world. “Everyone deserves organic, and this proposal would have made it harder for consumers to access organic produce as a meaningful solution to environmental challenges faced by growers (who) need to adapt to site-specific conditions,” he says. The NOSB ballot count wasn’t an overwhelming landslide but a squeaker win with an eight to seven final tally to reject proposals prohibiting hydroponic/aquatic production certification. By a much larger margin (14 to zero, with one abstention), however, aeroponics was denied the organic certification. The NOSB recommendation is now in the hands of USDA. The federal agency and the staff of the National Organic Program will decide on the rules to modify existing organic standards. Once that is done, there will be a public comment period and a regulatory review before the new classifications become regulation. INTENSIVE 5 DAY WORKSHOP IN CONTROLLED ENVIRONMENT HORTICULTURE- WITH SPECIAL EMPHASIS ON HYDROPONICS/SOILLESS CULTIVATION- AN EVENT SERIOUS NEO-FARMERS AND POTENTIAL FARMERS, AGRONOMISTS, AGRI-CONSULTANTS AND EVEN AGRI STUDENTS MUST NOT MISS. The dates are now fixed for the two five-day workshops on Controlled Environment Horticulture being conducted in North and South India back to back. Venue in both parts is being worked out. The workshop will be conducted by Mr Tony Bundock from Australia, who has decades of experience in Controlled Environment Horticulture among other subjects. He is also a Director on the panel of the famous institution Protected Cropping Australia and reigning Secretary of the Hydroponics Farmers Federation of Australia. . Tony also has worked as a senior instructor at The Chisholm TAFE Victoria and as is a Certified Master Trainer for world leader Priva Holland climate control and irrigation systems. Tony is the Founder and Director of Genesis Horticulture based in Narre Warren Melbourne, Australia. His last stint was with Australia's numero uno company Powerplants Australia. Those who wish to register their interest may please do so by email to ceo@petbharoproject.co.in along with their WhatsApp nos. It was a pleasure to meet and spend a few hours with Richard Stoner known as the Father of Aeroponics at the University of Agricultural Sciences Dharwad, Karnataka recently. Being with him as always is awe inspiring and there is always something more to glean from his vast terabyte library of knowledge and experience. Pet Bharo Founder and Farmer-in-Chief delivered a TEDX talk at the PESITSBC College Bangalore on the 18th March 2017. The topic was "Hydroponics and the future of Urban Food". In this talk he explained how hydroponics will be a technology to mitigate food insecurity in the face of rapid urbanisation among many other ills. The audience loved the talk and its persuasive content egging people to grow something within their homes to ensure food security in the cities in the very near future. The Pet Bharo project created history recently by conducting the first ever Simplified Hydroponics workshop at Mangalore Karnataka. CV gave a full day teaching students the nuances of hydroponics. 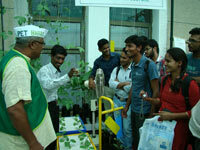 The students went home happy that they could now go home and start their own simplified hydroponics garden. 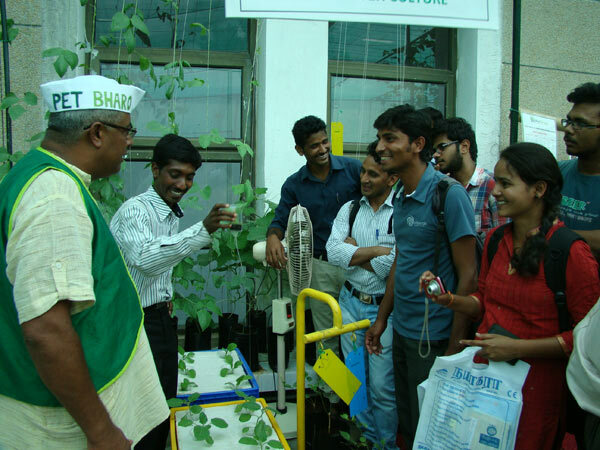 What the students were most fascinated about was the fact that in simplified hydroponics one can grow veggies and herbs at extremely low cost to feed their family with pesticide free, highly nutritious food. CV's message was loud and clear "GROW LOCAL EAT LOCAL" and was well received. On world earth day a huge workshop is being planned for the benefit of all Mangaloreans. Watch this space. Pet Bharo also wishes to thank Punit Shetty, Shamithave Hegde and Joyson D'Souza for the local support that made this event a great success. Also Pet Bharo wishes to thank Glitz Entertainment Mangalore , for their wonderful support through the day before and after , that really helped. Our Chief delivered a Lead Paper at the "National Consultative Workshop on Protected Cultivation with references to Soilless Cultivation/hydroponics. He delivered a speech that was of high substance which was titled " Greenhouse Management Methods and Good Root Zone Management." The event was conducted jointly by the University of Agricultural Sciences Dharwad in collaboration with Indian Society For Protected Cultivation, IARI, New Delhi. The audience went home learning a lot from CV's talk which underscored the need of great skills to manage greenhouse environs. 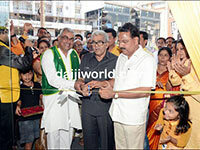 Our CEO and Farmer-in-Chief Lt Cdr CV Prakash (retd) IN was the Guest of Honour at the opening of the first dedicated Organic supermarket at Mangalore on the 29 Jan 2017. 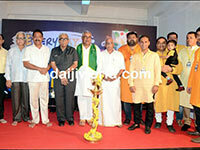 His speech urged Mangaloreans to take up growing vegetables and herbs at home using soilless growing methods. The audience were very convinced and Our Chief agreed to teach and train citizens of Mangalore through regular workshops. The first ever hydroponics training workshop will be held on the 12 Feb 2017. A Hydroponics Technology demonstrator project was carried out by me at the Karnataka Vikas Grameena Vikas Bank during the past one year. In phase 1 several leafy and vine crops were demonstrated and in phase II it was decided to do Ginger. The staff at this bankl being novices returned a yield of 12 tonnes per crop in 6 1/2 months for Nadia variety of Ginger. Professionally done this should be nearly 60-80 tons per acre. 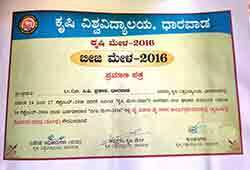 Pet Bharo Founder and Chief Lt Cdr CV Prakash (veteran) was recently given top honour by the University of Agricultural Sciences, Dharwad, Karnataka State with him being awarded a certificate as a "Jai Jawan, Jai Kisan" in recognition for his relentless work in Soilless Farming in India. It took nearly 8 years of perseverance on his part to finally be recognised by a government organisation of repute like the UAS Dharwad. 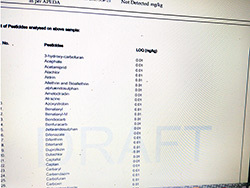 HARIT KRUSHI a client of ours producing world class Lettuce in Bangalore recently sent their produce for tests to check for Heavy metal traces, pesticide residues, biological contamination etc and guess what ? The produce returned results that showed how safe the lettuce is for human contamination. 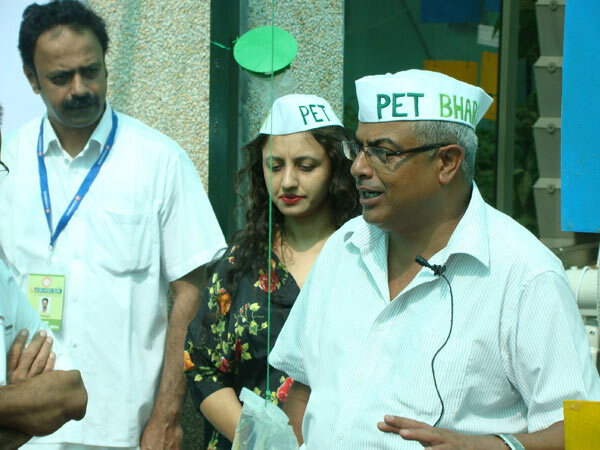 Pet Bharo continues to set benchmarks in a time where people are not sure what to eat for fear of being poisoned by dangerous chemicals n biological contamination. 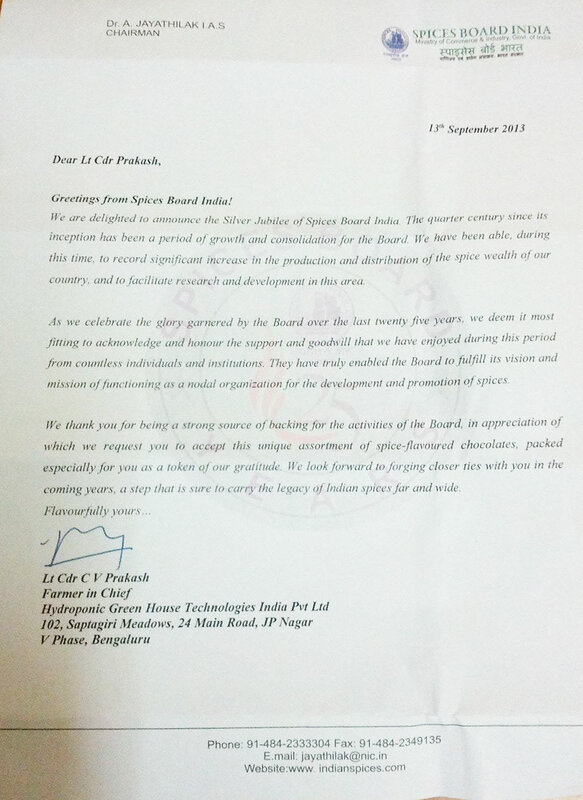 "Pet Bharo receives Letter of Appreciation and Gift from Chairman, Spices Board of India"
"Pet Bharo" gets letter of appreciation from CEO and Founder, Efarm, Chennai"
Founder, Chief Visionary,Farmer-in-Chief of the Pet Bharo project has been given the honour and invite from CEO of Efarm's (www.efarm.in) Chennai,another great organisation to address their participants at their next workshop at Mylapore, Chennai on 5/6 oct 2013. Record turnout is expected at the workshop. More details can be seen on this page after the event. 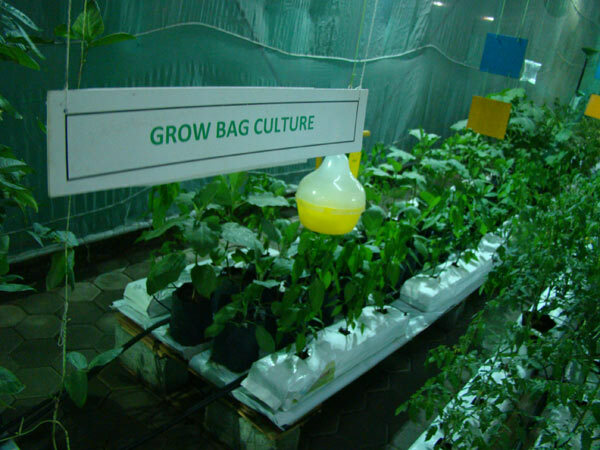 HGTIPL along with an NGO in Karnataka will be training 16 women in poverty in April 2012 in simplified hydroponics. Towards this Bluelab Corporation of New Zealand www.getbluelab.com has been kind enough to sponsor 2000 USD worth of their world's best pH/EC/Temp Combo Meters to HGTIPL. The sale proceeds of the Bluelab Combo meters will be used to train these 16 chosen women in poverty free of cost. A letter from Bluelab is seen below. HGTIPL was recently invited as a keynote speaker at the NIABI 2012, also called the 'Global Agri-Business Incubation Conference' , organised by ICRISAT, NAIP, ABI-ICRISAT, IARI and the NIABI (Network of Indian Agri-Business Incubators). It is with great happiness that we announce that ISH has won its third order in less than eight months, for a 2 acres State-of-the-art Commercial Hydroponics Greenhouse System from a client in Zambia on 01st Aug 2011. First acre will produce Strawberries and the other will produce Bell Pepper. Another 2 acres will be added to make it four acres in six months time. ISH will provide the Agronomist and Consultant for this prestigious project. The project will commence end Sept 2011 and be ready by the end of Nov 2011. The client is a large corporate from India which has agricultural activities in Zambia. 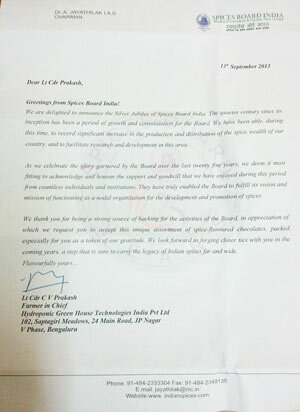 ISH is happy to announce that it bagged on 23rd March 2011, its second Commercial Hydroponics Lettuce/Herbs order" from a client in Coimbatore. This within three months of its first commercial hydroponics greenhouse order to set up a strawberry greenhouse at Bangalore. The state of the art Lettuce/Herbs Greenhouse will initially start with a one acre pilot expanding to 4 acres in next one year. After three years of persistence, perseverance and hard work in India, we are beginning to feel the winds of change sweeping across India. When I first spoke of Hydroponics/Soil-less cultivation we received many bouquets and brickbats, but we toiled on showing Hydroponics technology at work in reality using simple hydroponics. The Institute of Simplified Hydroponics Bangalore, India is proud to announce the setting up of the first Hydroponics Commercial Strawberry Production system measuring one acre of climate controlled Greenhouse. This is the first Pilot and is expected to increase by hectares in a couple of years after the success of the first one. The system being installed by ISH under the supervision of our Korean principals "Bokyung Greenhouses". The system installation has begun and is expected to go on stream in May 2011. Our Institute has been spearheading Hydroponics since Oct 2008 and this is our golden hour and a big milestone for all of us. Initial market for our strawberries will be the city of Bangalore and the strawberries are to be marketed at exclusive outlets and also at the farm gate itself.
" 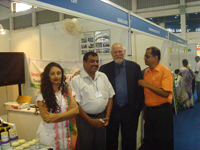 ISH Bangalore will be participating at the Agri-Intex 2010 at the CODISSIA INTERNATIONAL EXHIBITION CENTRE AT COIMBATORE , between 30 Sep 2010- 2 Oct 2010. This is based on the back of a successful exhibition in 2009. 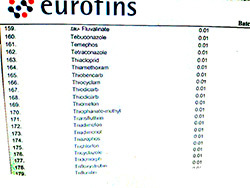 This includes AUSTRALIAN "Wheat Grass growing system, Barley Fodder System, Tomato and Lettuce/Herbs systems using NFT (Nutrient Film Technique). These are one more step ahead of the Simplified Hydroponics Systems that were displayed last year. There is also an opportunity for vendors to discuss with us regarding contract manufacturing of various components of the system. All those wishing to meet us specifically to set up Commercial Hydroponic Greenhouse systems are also welcome to meet with us to discuss. During this exhibition we also plan to appoint distributors for our products and services. In case you need any prior information before the exhibition kindly contact our Chief Operations Officer on mob no 0-94806-14645. All are cordially welcome. How often do you encounter a farmer sporting cargos and a t-shirt, spraying neem fertiliser, all the while headbanging to Iron Maiden? Take a trip to Pritham D’Souza’s farm in Kinya (Mangalore), and you are bound to encounter this very avatar of the ‘metal farmer.’ What makes this young agriculturist even more interesting is that he employs simplified hydroponics — an innovative method of farming that is characterised by the lack of soil. 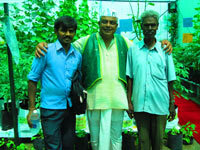 Farmers Impressed with Chinese Hydroponic Growing –Times Of India Bangalore 8th June 2010. Indian farmers who recently visited China to see latest growing practices have returned happy knowing that Hydroponics/Soil-less cultivation is a norm in China amongst farmers there and are willing to try it in India. ISH India’s Chief Visionary, Lt Cdr (retd) CV Prakash, was specially invited as a speaker as well as Chairman of Session VI, by the conveners of the recently held “Conference on Food and Water Security at Ahmedabad-26/27th Mar 2010”. The conference was held at the prestigious Ahmedabad Management Association campus near IIM Ahmedabad. The programme was inaugurated by the Minister for Agriculture, Shri Dileepbhai Sanghani and the topics were covered in seven sessions of 2 days. 1. Food Security in Global/Indian context. 2. Water for Food Security. 3. Food security and better management initiatives. 5. 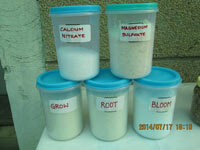 Role of Bio-technology and fertilisers. 7. 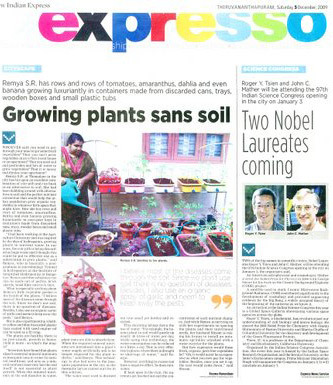 Alternative technologies for better food productivity (CV spoke here on “Commercial Hydroponics-Its Viability”). ISH India’s topic was the one that won the highest applause and response from the participants judged by the number of people that thronged him after he finished his speech. We are proud to say that in a short span of just thirteen months of operations in India, ISH has received national recognition. It was just an idea, a seed, now its crossed the cotyledon stage. More people in India are becoming aware of this technology and its a great sign, for certain. In helping our new Franchisee in Gujarat get on his feet, ISH India on the 28th Mar 2010, held a very valuable and excellent awareness seminar on Simplified Hydroponics at the Country Inns and Suites Hotel at Ahmedabad. 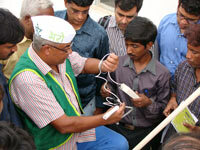 More than 125 people from all over Gujarat attended the program. The program was conducted in three sessions of 2 hours each. 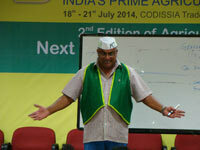 The Speaker was the Chief Visionary, Lt Cdr (retd) CV Prakash himself. 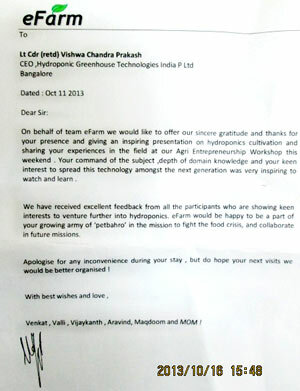 CV took the participants through the nuances of this technology in a manner that it could be understood by any layman. The progressive Gujarati participants were very active and they asked a lot of questions and were thoroughly convinced of the technology and its benefits. The participants belonged to various disciplines of life and industry. An announcement was made at the end of each session about the new Franchise in Gujarat being ready to commence operations in the second week of May 2010 with training being made available locally for all the people of Gujarat state. The participants were really happy that the technology and training would soon be made available within their state itself. ISH India is pleased to announce that more than 85 participants have expressed their willingness to participate in the training programme as soon as it is announced. The response was overwhelming and we are pleased no end. The Chief Visionary, Lt Cdr (retd) CV Prakash, is happy that with consistent effort the science of Hydroponics is now spreading fast in India. "With Gujarat taking on the gauntlet, I am sure more states will take up franchises in the near to long term". Maharashtra, West Bengal, TN, AP, Uttaranchal, UP, Himachal are also showing keen interest in taking up franchises very soon and we are certain that Simplified Hydroponics will spread to all states of India very soon" says CV. 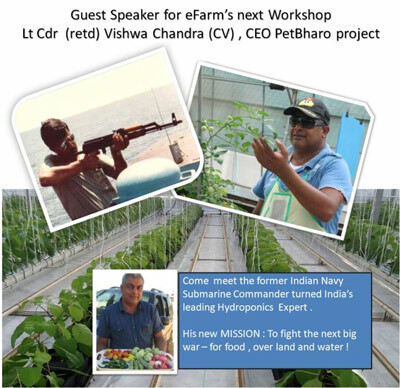 Our Chief Visionary, Lt Cdr (retd) CV Prakash, of the Pet Bharo Project , a project of the Institute of Simplified Hydroponics, Bangalore, has been invited amongst a halo of accomplished speakers from various industry bodies and corporations to speak at the " Food Security through Water Security " Conference to be held at the Ahmedabad Management Association, Ambavadi, Ahmedabad, to be held on 26th and 27th Mar 2010. CV will speak on the topic " Commercial Hydroponics- Is it viable? " It is indeed a great honour for us to have our Chief elected to speak at this seminar. 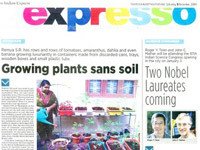 The topic is expected to create a new awareness amongst new and budding agri-business entrepreneurs. Inflation based on the Wholesale Price Index (WPI) has inched up only marginally even though prices of essential goods have gone up exorbitantly on yearly basis, as reflected by the Consumer Price Index (CPI). The difference between the indices presents a grossly misleading picture of the sharp price rise across the board in consumer goods and deflects the attention from the real plight of those millions who have to manage their expenditure on a fixed income. Did you realise that the food on your table just got costlier? Vegetables, especially the common o' garden ones you use every day — onion, garlic, tomato, potato, lady's finger, capsicum and even ridge gourd — are selling at abnormally high prices in the city. Let alone private shops, even the HOPCOMS outlets are selling them at increased prices owing to limited supplies. Prices may soar, the slowdown may dig in and jobs may be on the way out but none of these have managed to stop Bangaloreans from celebrating Dasara with exuberance. The price of rice, sugar, fruits and flowers have soared to new heights. But it looks like the Bangaloreans’ resilience has kicked in: many tightened their belts on other days so that they can afford to celebrate Dasara uncompromisingly. 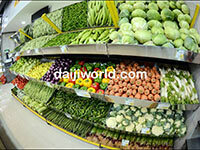 Vegetable prices across the region have spiralled in the recent days, owing to heavy rains across the region. Prices of common vegetables, such as peas and tomatoes have shot up in the region. The price of cauliflower has also increased while other vegetables remain at a stable price. Floods have brought misery to consumers in the city. 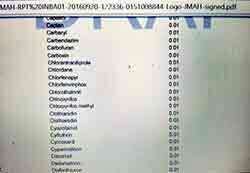 With the century’s worst floods washing away standing crops in north Karnataka and Andhra Pradesh, prices have soared. A kg of coriander, which used to cost Rs 15, has gone up to Rs 65 - a 333 per cent jump. Spinach, used for salads, has climbed from Rs 16 a kg to Rs 50 per kg (212.5 per cent). Fenugreek has seen a Rs 30 increase. It costs Rs 66 per kg (120 per cent jump). This winter Indians have a diet plan they can finally stick to. As vegetable prices skyrocket, consumers are spending more but their grocery bags are much lighter. The latest numbers tell it all: potatoes were retailing at 102 per cent more in the second week of December than a year ago. On average, fruits and vegetables are 33 per cent more expensive than in December ’08. Even cereals cost 13 per cent more, and pulses 40 per cent more. Finally, with food inflation at 19 per cent, the government has stepped in to say rising prices are a “cause for concern”. Did you know that there is a 400% mark-up on vegetables in the last mile when it travels from the wholesale market — the mandi — to the vegetable vendor? If cauliflower, for instance, is being sold by dealers at Rs 5 a kg at the mandi, by the time it travels a few miles to the vendor its price is Rs 20-25 a kg. an organisation based out of Trivandrum and involved in imparting training in the areas of Advanced materials, Nanotechnology, Electronics, Medicine, Health care, Environment, Energy, Clinical Research, Biotechnology, Genomics and Proteomics and Information Technology. The MOU allows INCITE, on a non exclusive basis, to bring together people from all walks of life to learn and implement Simplified Hydroponics for sustainability and livelihood. 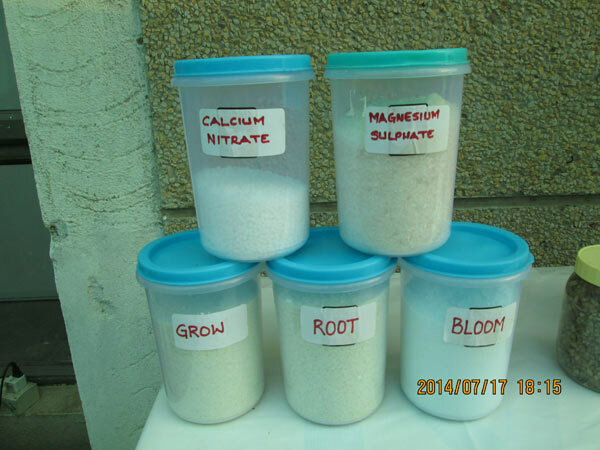 The idea is to allow ISH to provide technology transfer and also supply Hydroponics/Soil-less Cultivation inputs to the people and also work with Banks to provide Microfinance loans in order to uplift the people of rural and backward areas and also in addition provide a platform for people who wish to become a part of the Urban Agri Revolution. 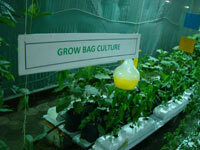 All training will be done by the Kerala Franchise of the Institute of Simplified Hydroponics, Bangalore, viz. ISH Kerala based in Calicut. ISH will also work with INCITE for programmes involving our Semi-Commercial and Commercial Hydroponics Systems in India and rest of the world on a non exclusive basis. What started as a Dream has become a Reality with the 'Pet Bharo Project' completing successfully one whole year in India since its launch on 7th Nov 2008. ISH Chief Visionary, Lt Cdr (retd) CV Prakash, IN said "I walked in to uncharted territory last year, into the unknown, all I knew is that I deeply believed in my idea, the rest was the universe and the great powers above that created the perfect settings to make 'Soil-less Cultivation and Hydroponics' a living Reality. ISH successfully trained above 500 students during this year from across every corner of India. The gardens built by our students stand testimony to this reality. I am confident that given the persistence, perseverance and hard work from my magnificent team that shares my vision, in the face of every challenge, the technology will become a cog in the wheels of the second 'Green Revolution' in India. ISH wishes to thank just about everyone who have furthered our dream and vision in the onslaught of sometimes even violent opposition to the introduction of this technique into India. I am grateful to this idea that used me"
The Institute of Simplified Hydroponics had its proudest moment on the 9th Nov 2009, when its Director R&D/Trg was honoured by the Dr Premnath Agricultural Science Foundation (PNASF) at the International Conference on Horticulture held at the Windsor Manor. Prof BS Prabhakar, a renowned ex-Senior Scientist at the IIHR (Indian Institute of Horticultural Sciences, Bangalore, was awarded a Silver Medal for his contribution of decades towards "Promotion of Vegetable Agronomy". The award was given by His Excellency, Mr Hans Raj Bharadwaj, The Governor of Karnataka at the inaugural function of the Horticultural Conference. The ISH in league with the EMPRI (Environment Management and Policy Research Institute started its Soil-less cultivation awareness programmes at Shimoga between the 6-9th Nov 2009 at Shimoga. The awareness training was conducted again by an alumnus of this Institute Cdr (retd) BB Khilari, a practitioner of Simplified Hydroponics and a die-hard proponent of the same. ISH is proud to have such a senior student as a permanent member of the Institute rendering yeoman service towards this technology. ISH Soil-less Cultivation drew immense interest amongst Agricultural Scientists/Professors and Agricultural-Business leaders at the ICH (International Conference on Horticulture) Bangalore 9-12th Nov 2009. Many Governmental and Private individuals including corporates evinced great interest in being trained in the technique of Soil-less Cultivation/Hydroponics. ISH is Gung-Ho about the way the future of this technology is expected to go. The "Pet Bharo Project" was recently showcased at the now famous Agri-Intex 2009 held at the CODISSIA Exhibition Centre, Coimbatore, between the 2nd Oct 2009 to the 5th Oct 2009. ISH managed to create a great impact on people with its advocacy and realtime exhibits of Soil-less Cultivation and Hydroponics. 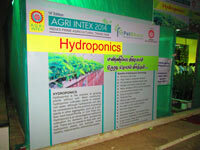 More than 99 percent of those who visited the stall were unaware of the possibilities of Soil-less cultivation and its attendant benefits, in a world, whose agricutural techniques are changing. Those who visited the ISH stall, were offered a One and Two day training course at a special discount. 1000's of people have expressed their willingness to attend and learn Soil-less cultivation methods either at Bangalore or at Coimbatore. The Chief Visionary of this project, Lt Cdr (retd) CV Prakash, IN, opines that seeing the response of people,ready to embrace Soil-less cultivation, it will only be a matter of time before many Indians take to this method of cultivation. 'CV' says Soil-less cultivation is a technology that has come to stay in most countries and Ïndians cannot be far behind. It is an imperative. 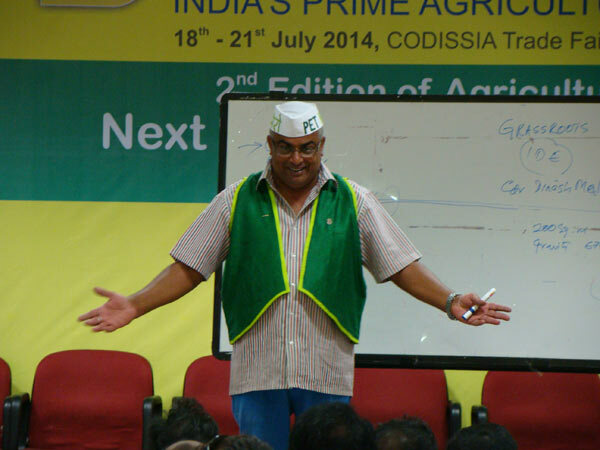 CV was also given a wild card opportunity to speak about his pet "Pet Bharo" project at the Agri-Intex 2009 conference and his talk on how common people could benefit from Simplified Hydroponics attracted wide attention and applause. ISH is proud to announce the promotion of Ms Sangeeta Bojappa, presently Director-Programs to Chief Operations Officer (COO) wef 07th Oct 2009. ISH wishes to thank her for the yeoman services rendered by her in furthering the vision and mission of the "Institute of Simplified Hydroponics". Sangeeta joined the organisation in Nov 2008 and ever since has been persevering to promote Hydroponics in a manner that it reaches and touches the lives of every Indian in order to achieve Sustainability and Livelihood. ISH wishes to thank her for her highest devotion and integrity that she has lent towards this cause, in spite of all odds." We, at ISH are indeed happy to have her on board our ship and wish that she continues this effort to achieve the next Green Revolution." 'CV' and his team wish her, many more accolades to come, God Speed and Good Luck. ISH Bangalore has been shortlisted for a Mega Project in Karnataka worth nearly 6 crores. ISH will set up nearly 20000 Sq.M of Hydroponic Vegetable and Herb gardens on the roof tops of 108 buildings. In addition ISH will supply 27 Fodder Machines each producing 2 Tonnes of Fodder per day. 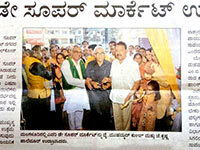 ISH, Bangalore has signed in Aug 2009 and MOU with district 3190 of the Rotary International in Bangalore. 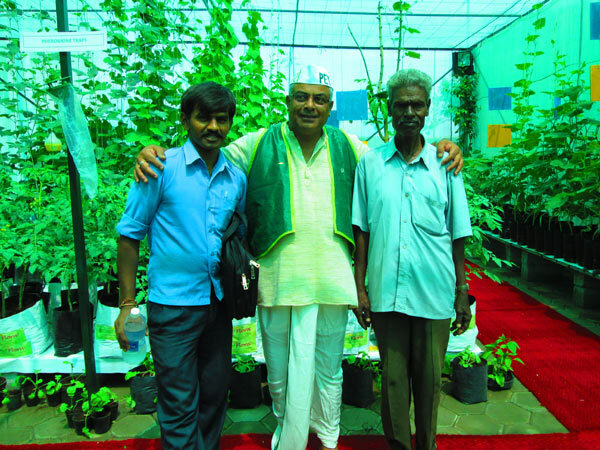 ISH has offered to train Rotarians in Urban Simplified Roof Top Hydroponics. 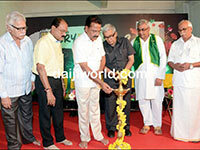 ISH, Bangalore has also offered to train people in Kerala State in conjunction with the Kerala Kisan Congress. 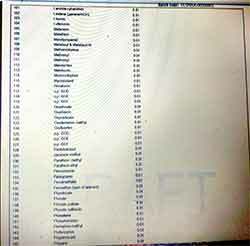 ISH will make a presentation in Kerala in mid Oct 2009 at Trivandrum. ISH is in final stages of signing up franchises in many states of India. 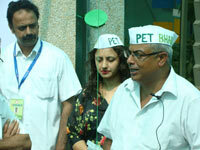 This will help spread the "Pet Bharo" project simultaneously around every part of India.